Description: Adds the Banshee Type-0 to the game. Game mode: Singleplayer, but should work multiplayer if server and clients are using it. The basis of what would become the Banshee hull. This hull has a Tier 1 Energy/Ballistic slot. This mod should work with everything, but if you're using an overhaul mod, balancing may be a bit off. Nice! I love mods like this that both seem balanced and add to the depth/lore of the game. Tech progression and immersion rock. This also seems like something that pirates would be using; basically a generation or two behind 'current' tech. 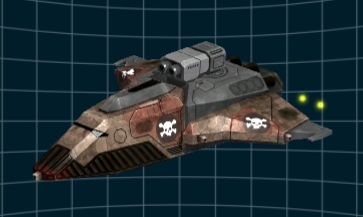 Mind if I try applying my pirate Banshee skin to it, see how it comes out? Haha, brilliant. It makes sense for pirates to be using it. I was considering making it the starting vessel for the fighter and scout classes. Looks great also. Maybe you should post it as well? Updated with Omni weapon slot! So I don't think I ever asked on this ship model specifically, but would you mind if I tossed this into BTC? I even have a purpose planned out for it! I've always wanted to have a knife-fighting ship in the game, and I figured this would fit the bill. Think the Arilou ships from Star Control if you've ever played it; 360-degree weapons and insane maneuver, but you really need to take care to avoid being hit or it's going to... hurt.